The first canton in the province of San José in Costa Rica is San Jose. National capital city of San Jose is here. 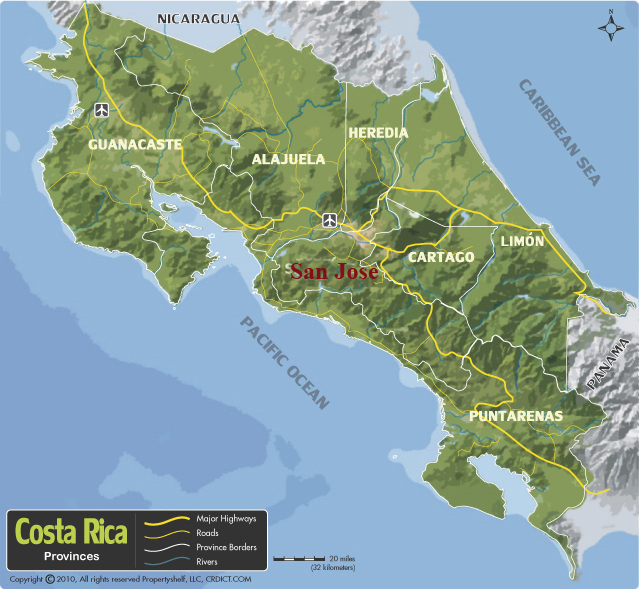 Covering an area of 44.62 km², San Jose is of the largest cantons of San Jose Province. It has 6,455.71 inhabitants/km² and the total population is 288,054. The canton of San José is subdivided into 11 districts (distritos). In pre-Columbian times the territory that now the canton of Escazú, was a place where travelers took rest. Some of those semi-nomadic groups settled in the place, exploiting the richness of the soil for their crops. Thus was this indigenous population was consolidated, the so-called United Huetar the West, which at the beginning of the conquest was the chief domains Garavito. Desamparados was created on November 4, 1862. This is the third most populous state. Desamparados is renowned for its ethnic and cultural diversity. The canton covers an area of 118.26 km², and has a population of 206,708. In pre-Columbian times, the territory which now known as Puriscal, was part of the dominions of the chief Pacacua. It has pleasant semi-rural setting with enough modern city touches like good restaurants, golf and hotels. The name of the 5th canton in the province of San José in Costa Rica is Tarrazu. In pre-Columbian times the territory that now the canton of Tarrazú, was inhabited by indigenous Huetar. The capital city of the canton is San Marcos.